Chia is a summer annual herbaceous plant belonging to the Labiatae family. It grows from a seedling to develop lush green foliage before it produces long flowers which are either purple or, less commonly white. These flowers develop into seed pods to produce chia seeds. Today, chia is grown commercially not only in its original land Mexico, but as well in several Latin American countries and Australia. Currently touted as the new superfood, chia is gaining a tremendous amount of attention in the press. It has even been praised by Dr. Oz for its health benefits. All of this attention naturally leads to the questions of exactly what chia is, where it comes from and what kind of benefits one can expect by using chia. Where Does Chia Come From? Although chia might seem to be relatively new, in reality, it is actually an ancient food source. For centuries, chia was used as a staple food by native peoples throughout Mexico and the southwest. At the time, chia was known as a running food and was used to boost energy and endurance. Chia has been recorded as being used for such purposes back to the ancient Aztecs. It is believed that Aztec warriors would subsist solely on chia seeds during important conquests. According to Jesuit historians, the chia plant was considered to be one of the most important crops grown by the Aztecs, coming in third only behind maize and beans. While the use of chia is well documented among the Aztecs, it was also used extensively in the southwest, as well, where native peoples would consume a small spoonful before heading out on long marches. Throughout the region extending from the Colorado River to the Pacific coast, native peoples would bring chia with them when embarking on long trade routes. Once Spain conquered Latin America, the use of chia became a taboo practice and the plant was even prohibited from consumption under the new rules that were set in place as part of the new regime. Chia is derived from the salvia hispanica; a flowering plant that is actually a member of the same family as mint and sage. The word chia originates from the Nahuatl, an ancient Aztec language, where the word chian, means oily. 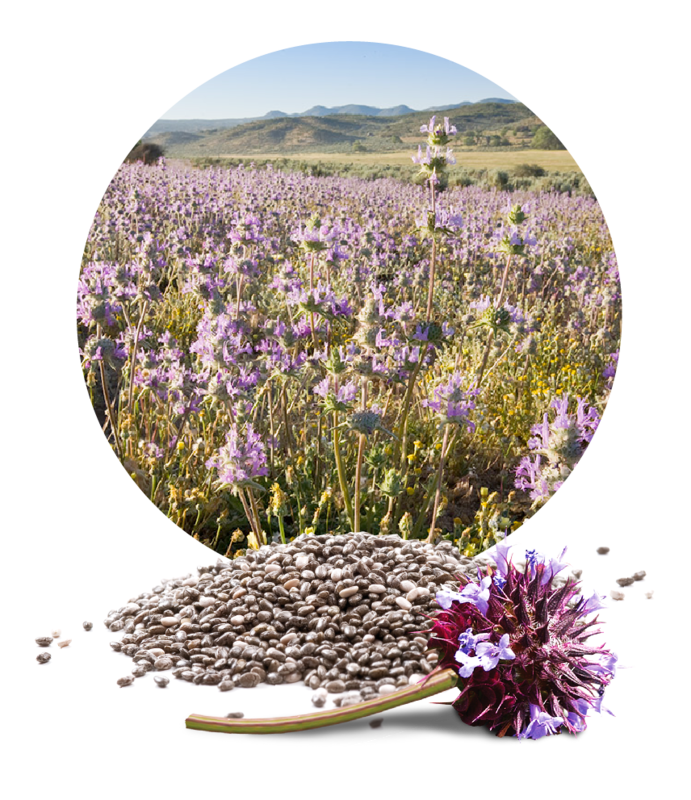 When the chia plant blooms, it produces purple or white flowers. The seeds of the chia plant are typically very small and oval shaped. Chia seeds often have an irregular color combination that may feature shades of black, brown, white, or gray. This annual herb plant can reach a height of more than three feet in height. Chia originated in the central valley of Mexico, and has recently been taken to other parts of the world. Today, since chia has once again become renowned for its health benefits, it is now cultivated in Mexico and Guatemala as well as farther areas, including Australia, Argentina, Peru, Bolivia, and Ecuador. The modern world first became acquainted with chia when it was introduced as a fun and innovative way to grow pet-shaped plants like hair. Today, chia has far more benefits that extend beyond an interesting looking houseplant. Much of the modern recognition of the health benefits of chia can be attributed to Wayne Coates, Ph.D. While working at the Office of Arid Lands Studies at the University of Arizona, Tucson, Dr. Coates co-authored a book regarding the health benefits of chia. Since then, chia seeds have once again become renowned for their amazing health benefits. What exactly are the health benefits of chia and why are so many people now interested in these small seeds? Along with their fabled endurance, chia is attributed with a number of crucial health benefits. While the native inhabitants of the southwest had to grow their own chia plants, today it is possible to attain the same health benefits through a variety of products, including delicious chia fruit spreads.